Fire Projects always recommand to use repeater fire alarm control panel in security cabin or place where 24x7 human presence is available. 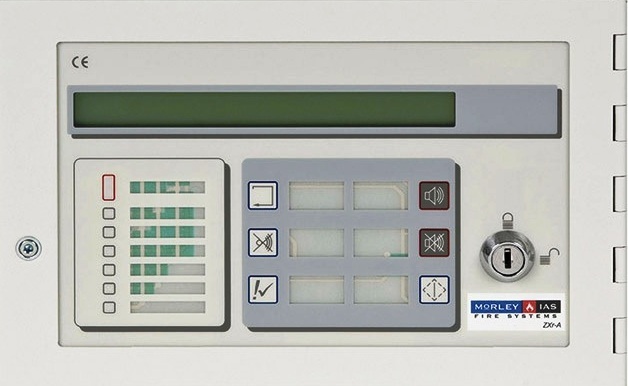 The Morley-IAS repeater control panels are compact remote control units for Morley-IAS intelligent multi protocol fire alarm control panels. Morley-IAS products supplied by Fire Projects avaialable with other I/O peripheral devices and the external printer further enhance the flexibility and functionality of our fire alarm control panel range. Morley-IAS repeater fire alarm control panel provide an extension to the operation of the fire alarm control panel. There are two types available - passive with indications only and no controls, or active with both controls and indicators. Both display the operational state of the control panel using the 80 character LCD display and the 7 LED status indicators. In addition to the general status indicators the Active repeater is fitted with key operated “Access Enable” switch for the control functions. Individual buttons are provided for System Reset, Mute, Accept, Sound Alarms, Silence/Re-sound Alarms and Self test. Thus enabling control functions to be duplicated in strategic locations around the installation. The Active repeater includes an integral self test sequence guiding the operator through a preset sequence to test the functionality of the control buttons, key-switch and display indicators. Fire Projects connect each repeater panels to the Morley-IAS fire alarm control panels using the RS485 peripheral data port as shown in the schematic overleaf. A maximum of 31 active repeaters can be connected to the peripheral data port. The fire alarm control panel supervises the connection between itself and the repeater, proving the integrity of the cabling and indicating faults both on the repeater and the fire alarm control panel. Passive repeaters are not supervised, but a loss of communication with the fire alarm control panel will be indicated on the passive repeater. The repeater requires an external power supply of +24Vdc (nominal) to operate. Power may be taken from the auxillary supply of the control panel or from any other suitable dc power supply. J-102, Vishwas City-2, R.C.Technical Road, Ahmedabad - 380061 Gujarat, India.